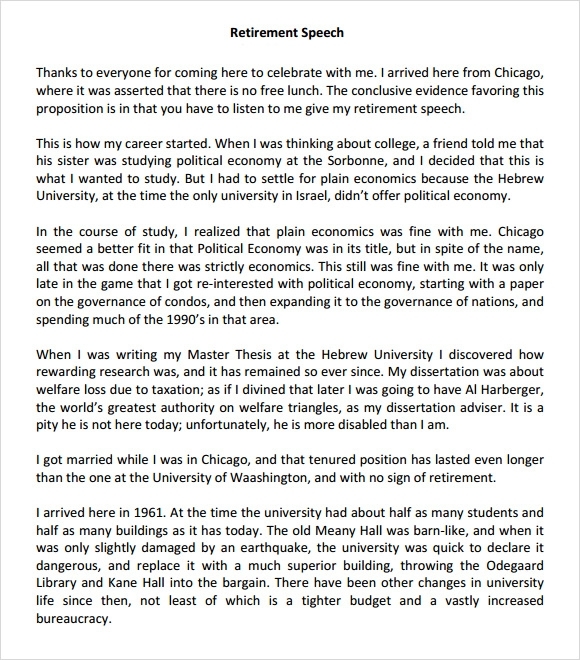 A retirement speech that conveys your feelings is supposed to be perfect. Pick the sentiments that suit you and deliver a heart touching speech. You don’t want your speech to be boring and may need some humor in it. Add few quotes which will make it sound thoughtful. Take some ideas for a simple yet eloquent speech. 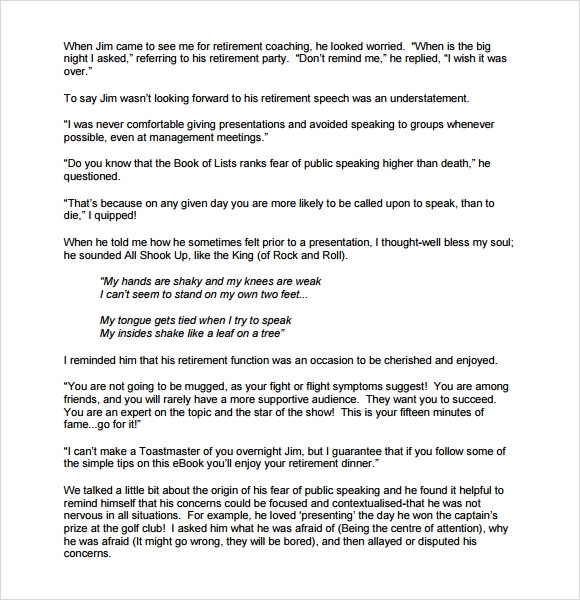 Here are some free examples of Retirement Speech Templates available in both word and excel. You can download them in suitable format. If you wish to print, please go for it and give your best on your most special day. If you are not very comfortable in public speaking then keep your retirement speech short. For every retirement speech, you must show your appreciation for the presence of the guests. Your speech should start with thanking them for lending their time and ears. 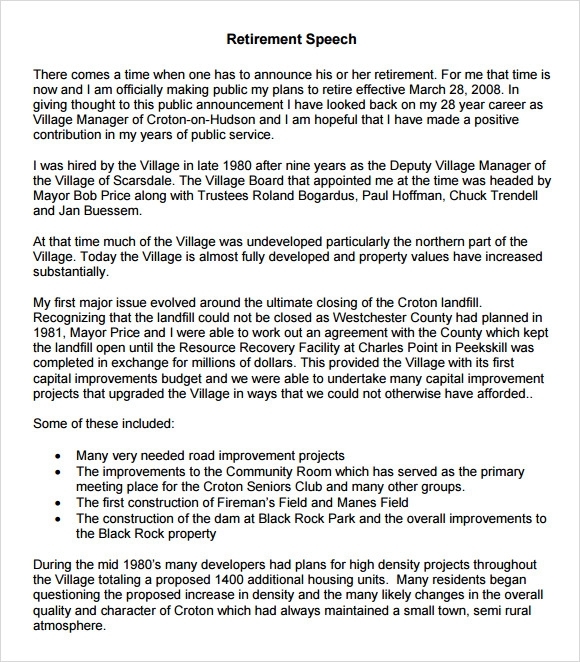 After that put some light on how the retiree got involved with the organization. Tell the audience about the bonding of the retiree with colleagues and superior boss. Inspire everyone present there by sharing his development as a professional as well as human being with them. 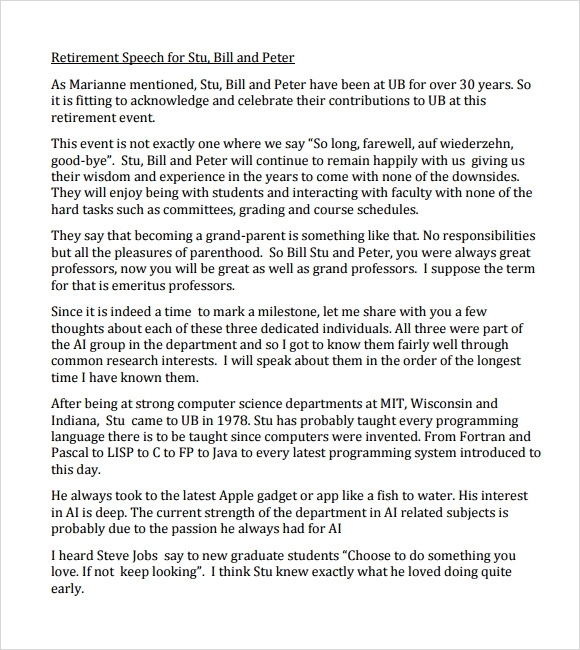 End your speech by wishing the retiree all luck and prosperity for the future. Usually colleagues throw a party to celebrate the day of retirement. 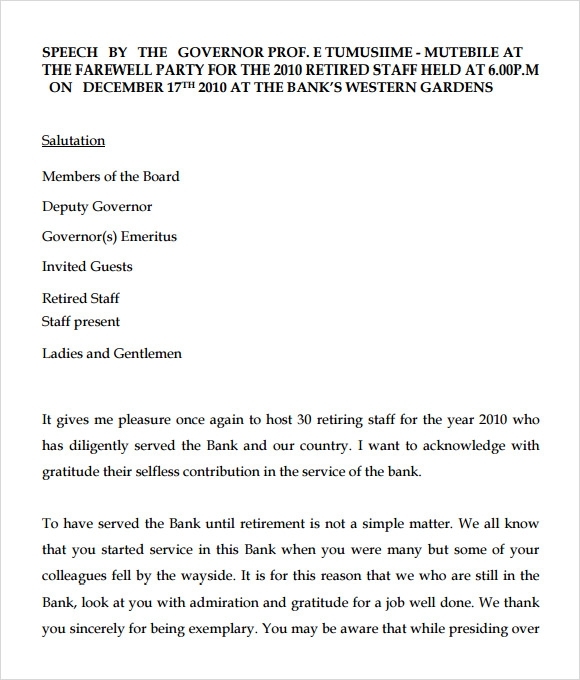 On such occasion, don’t give any such retirement speech that can spoil the party spirit. 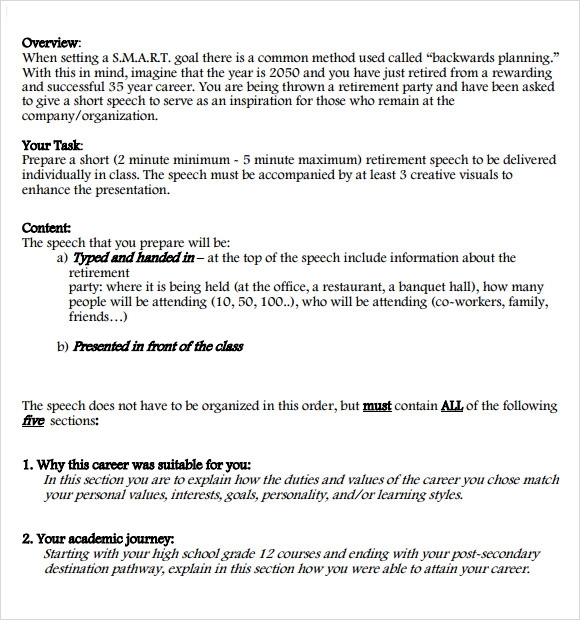 Here, you can be little light-hearted and include funny lines in your speech. You should start your speaking by conveying your gratitude to guests who are present with you on this memorable day. Talk about the retiree’s initial days in the organization and about those remarkable memories that you have with him/her. Share your experience in zest and how you all get benefitted from the retiree’s association with the organization. 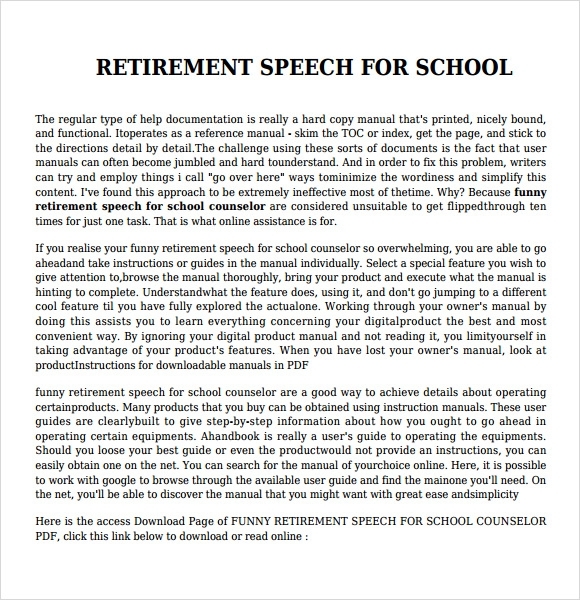 Retirement speech of school must be prepared very carefully as in a learning zone, it is not at all appropriate to crack a funny joke or ambiguous one liner in middle of the speech. It simply does not go with the ambience. If you are honoring any senior teacher or principal, you should pay due respect to him/her through your speech. Never forget to mention their effort to improve the quality and process of learning. You can mention the passion he/she has for teaching students. It will be no harm to share his/her special achievements during his/her career. You can end your speech with an inspiring quote or poem. Why Do You Need Retirement Speech? Retirement speech and Presentation Speech Examples gives you the scope to show a good gesture to the retiree on behalf of the entire organization. In professional world, we don’t have much scope to speak out heart out. When you are honoring a retiree, you got that golden opportunity to deliver a speech appreciating the person for his/her effort and presence in the organization. Always keep in mind the position and personal character of the retiree while preparing a retirement speech for him/her. Choose your words wisely. You can add humor but never cross the line making it vulgar. It is better to add some inspiring and touchy lines to the speech. Don’t make the speech a lengthy one. People may not always be interested to listen for long. 4. Keep a handy note or take a print out of the speech. It will save your time and embarrassment. When it is really time to say goodbye to them, it is hard. On this occasion, your retirement speech speaks of emotions and feelings that you and the organization have for the retiree. 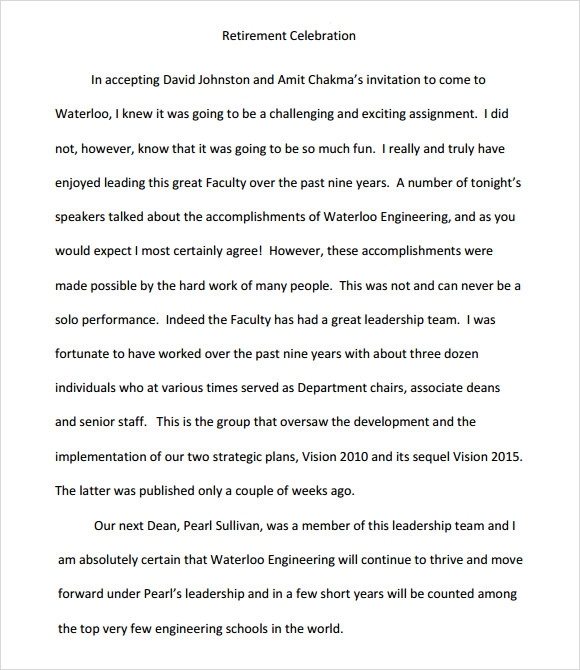 Retirement speeches complete a retiree’s farewell. 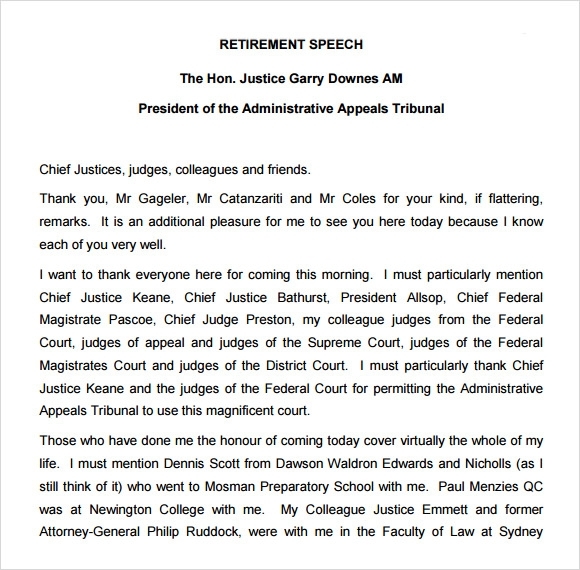 It echoes the positive things about the retiree which he or she deserves at the end of his/her tenure. Make the retiree feel happy through your words.